Authors to Watch is thrilled to be a host for the Layers of Veronica Blog Tour by Pump Up Your Book! As part of the tour, we've got the author, EMILIA RUTIGLIANO, here for an interview. Welcome, Emilia. Can you tell us a little about yourself? I’m a slash and proud of it. I’ve only recently learned what that is. I suppose I’m proud of every title I wear. I’m a Soviet Jew emigree who grew up in New York City. I was raised by a single mother who devoted her life to me. She thought I did everything wrong in my life until the day she died. I got my undergrad and law degree on scholarships and used the “student loan” money to travel with my boyfriend across Europe every summer. I married the love of my life, an Italian Roman-Catholic Brooklyn boy who still drives me crazy every day. Our three kids are vivacious, hilarious, talented mutts who have fun hanging out with us watching TV at home, bathing elephants in Malaysia, swimming in mineral springs in Hungary and getting fish pedicures in Cambodia. I practice law for a living. I write for fun. My girlfriend made me buy a NOOK and assured me that life couldn’t continue until I read Fifty Shades of Grey. I read all three books, and couldn’t for the life of me understand what the big deal was. She didn’t agree with my critique and challenged me “you think you can do better? Then write your own book.” So I wrote five. It wasn’t a competition. I wasn’t trying to improve or critique anyone. I just wrote the way I speak. My voice is prominent. Those that know me will tell you it’s impossible to separate me from the novel. I wasn’t trying to separate anything from anyone. In fact I gave Veronica my history because there was no sense in making something up just to make it more or less anonymous. It turned out to be a fun little story. Describe your writing process. Do you plot or write by the seat of your pants? Both, actually. I know the plot… as in I knew the milestones that were going to occur throughout the series before I began writing it. But everything else? I couldn’t for the life of me control any damn one of them! They shocked the hell out of me. One of the major characters who was supposed to be another lover…wouldn’t get into bed for so damn long, even I was beginning to wonder if he would eventually put out!!! Layers of Veronica is a series. It is a modern day fairytale in that there is nothing paranormal about it, and yet it unravels from poverty to affluence. From a broken heart to a full love affair. There was no lottery win. Veronica created the world by taking the opportunities and shunning the “known”. She’s also no different from many. Everyone finds a little Veronica in themselves. At present, the third book was just published. The fourth and fifth are at the editors. They were originally all published without an editor but with my apologies) and those that read the whole series became friends. Veronica is Veronica… I was just fortunate enough to write her story. It was always in my head. I gossiped about her on paper and my friends loved her. I wrote for them. I’m most grateful to them because they begged me, regularly, for installments in Veronica’s story. I’d write a chapter and send it to them. They’d critique it and beg for more. Some things I put in just for them. It was always fun! Of all of your characters, which one is your favorite? Why? None! I love them all. That’s really a Veronica answer. She doesn’t choose just one. EVERYONE has something different to offer… love, advice, experience. I’m thrilled at the different camps and factions that arise who LOVE and HATE the characters as if they were real people in their lives. Producing a labor of love that I KNEW would not appeal to the majority of the people out there. I wrote a character that was 35, divorced, did not wish to get married or produce more children; who had affairs with married men; broke the law; and slept with many lovers at the same time… while becoming wealthy, raising her children and practicing law. Which authors have inspired your writing? I like storytellers. I love a good story. HOW the story is told is something else entirely. Poetry is about how the story is told… and I love that too. I got my degree in Literature. I am a fan of different genres. There’s a line in PETALS.. it says “My life has become a Charles Dickens novel directed by Quentin Tarrantino.” Let’s go with that. I’m writing another series. It’s called ‘Alexandra’s Order’. It’s a different feel that Layers. But this series is also about a multi-dimensional woman who is capable of taking on and enjoying the world. 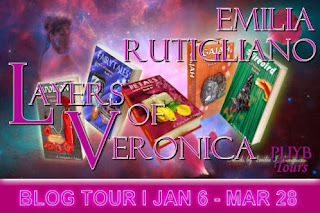 Visit Emilia Rutigliano’s website at www.layersofveronica.com.